Denise started her physical therapy career at Henry Ford Hospital in Detroit, Michigan, and spent 9 years working in acute care orthopedics, neurology, cardiovascular and pediatric areas and outpatient orthopedics. She has been back in Massachusetts for 20 years working in outpatient orthopedics and home care, spending the last 4 years at Bay State. Denise enjoys treating patients of all ages with a variety of orthopedic problems. 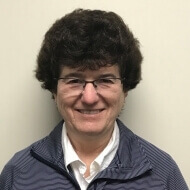 She has completed a wide range of continuing education courses including McKenzie courses, spinal and extremity mobilization courses, soft tissue and myofascial courses, orthopedic rehabilitation courses, as well as geriatric and neurology courses which have all helped her develop an eclectic approach to treating her patients. Interests: Denise enjoys spending time with her family and friends, playing golf, gardening, travelling and watching the Patriots and Red Sox. Denise is also active with her church community.